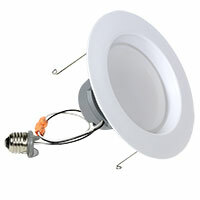 The GoControl Bulbz Smart LED Recessed Retrofit Lighting Kit (LB65R6Z-1) fits into 5″ or 6″ recessed ‘can’ lighting fixtures, replacing old, outdated incandescent screw-in bulbs with clean and attractive, soft-white efficient LED lighting. The LB65R6Z can be controlled wirelessly (On/Off/Dim) when used in conjunction with a Z-Wave controller/hub using the controller’s user interface (e.g. 2GIG GC2), or via a smart phone, tablet app, or PC. Depending on the capability of your controller/hub, once the Smart Retrofit Light has been added to your network, it can be added to a ‘Group’ or ‘Scene’ or change its status via your controller / app’s specific programming. Input power: 120 VAC, 60 Hz.